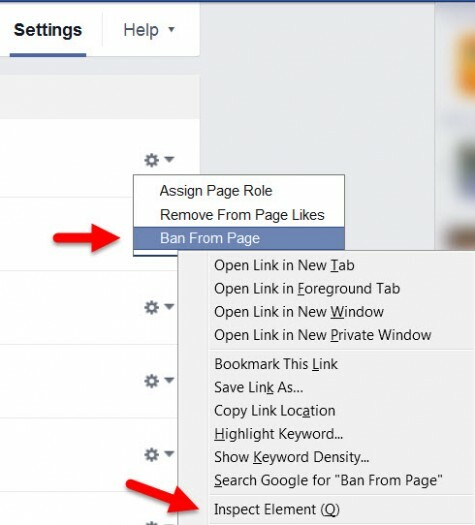 Have you ever wanted to ban someone from viewing your Facebook page because they are copying your content and pasting it in Facebook groups, online forums or using it as content for their own website or blog? In the past the only way to ban someone from viewing your Facebook page was to wait until they left a comment but now I have another way. If the perpetrator never leaves a comment on your Facebook page it is nearly impossible to ban them. Follow these steps and you can ban them even if they don’t leave a comment, ever! First, you will need the Facebook ID for the person you want to ban from your Facebook page. 2. Click Search. When the results come back, write down the person’s ID number. 3. Go to your Facebook page and click on Settings at the top right. 4. Click on People and Other Pages from the left menu. 5. Click the gear icon on the first person’s name that appears. We will only use the menu from this person and we won’t be banning this person. 6. Right-click on Ban from Page. 8. When the HTML screen appears, look for the line that shows page_id and user_id. 9. Click the three dots on the left (if you are using Chrome) and then click “Edit as HTML”. If you are using Firefox you can double-click to make that link active so you can edit it. 10. Erase the User ID number that shows on that line (this is the user ID for the first person we chose in step 5). Do not erase the page ID number. 11. Type the ID number for the person you want to ban that you got in step 2. 12. Do not press enter. Just close the HTML window without clicking anywhere else. 13. Click Ban from Page again (with the left button this time). 14. This time the person’s name you really want to ban will appear and you can click Confirm. Success! Now you have a way to block someone who is causing trouble on your Facebook without them commenting and without them knowing either. Please share. Facebook updated this a couple of times since. The newer methods were similar and worked as of a few months ago. However even with the newer (other pages) methods … Facebook now blocks this hack. If you edit the element, even with the newer elements being updated, you ban the original user and not the one you want. In other words, don’t do this. Facebook even sends a big fat warning to the Chrome dev console now. Sad but true, as we really SHOULD be able to proactively block people who are trouble makers rather than having to have them like a page. Some public pages still have information that specific people don’t need (and yes, they could browse from a different account, but many don’t think that far ahead). There may be ways around it, but don’t try and adapt this article to the new ban code unless you’re willing to accidentally force an unlike (even when you unban, they don’t show up as a like any more). Speaking from recent experience here.